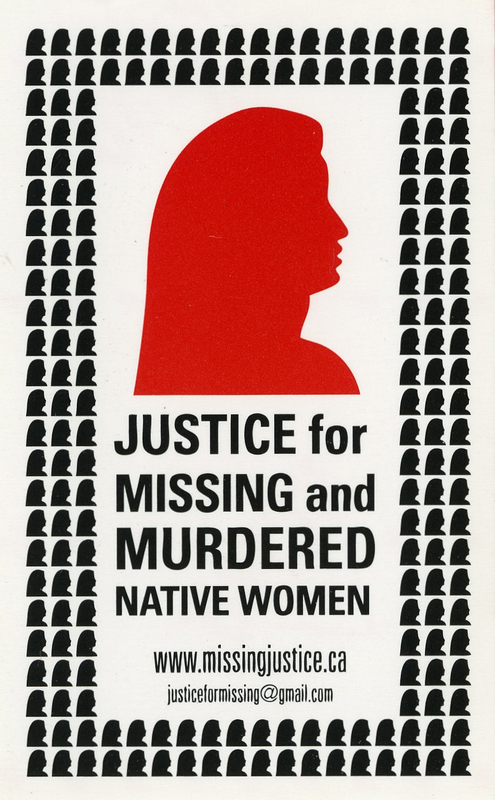 Awareness sticker for a grassroots campaign based in Montréal, Québec, Canada, that focuses on justice for missing or murdered indigenous women. According to the group’s website, “approximately 60% of the 3,000 women that have gone missing or been murdered in Canada since 1980 are Native, with approximately 500 cases outstanding in British Columbia alone.” Canada’s Amnesty International campaign, known as “No More Stolen Sisters,” also states that “Indigenous women are going missing and being murdered at a much higher rate than other women in Canada—a rate so high it constitutes nothing less than a national human rights crisis.” The repetition of the female silhouettes around the sticker’s border suggests a large number of women affected. The large silhouette in the center could be used to show strength and power, and the color red is typically associated with war, danger, and blood.